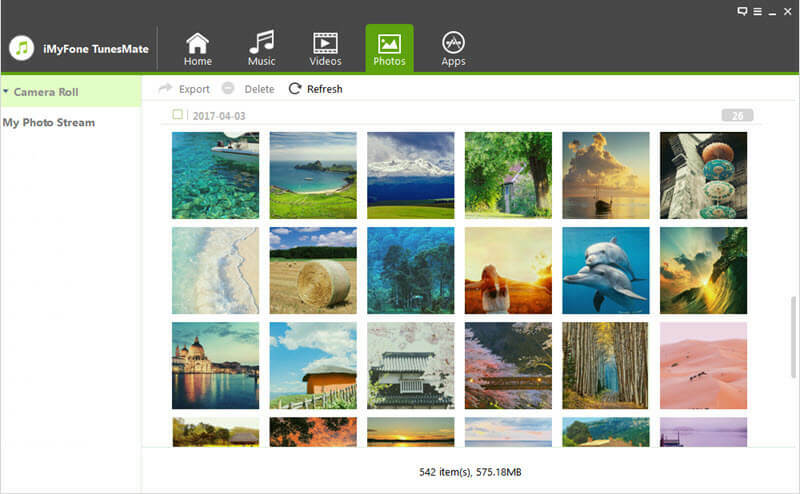 The "Photos" module of iMyFone TunesMate includes Camera Roll and My Photo Stream. Photos or pictures saved from third-party apps on iDevice, like pictures from Facebook, Snapchat, etc. Besides, all the albums on your iDevice can also be displayed on iMyFone TunesMate, such as Selfies, Panoramas, Screenshots, Videos, Slo-mo, etc., which allows to search the specific photos easily. It stores your most recent 1000 photos or photos taken in the last 30 days from Camera Roll on different iDevices with the same iCloud ID. You can access your recent photos captured from your iPhone, iPad, or iPod touch on your PC/Mac or other iDevices signed in the same iCloud ID. 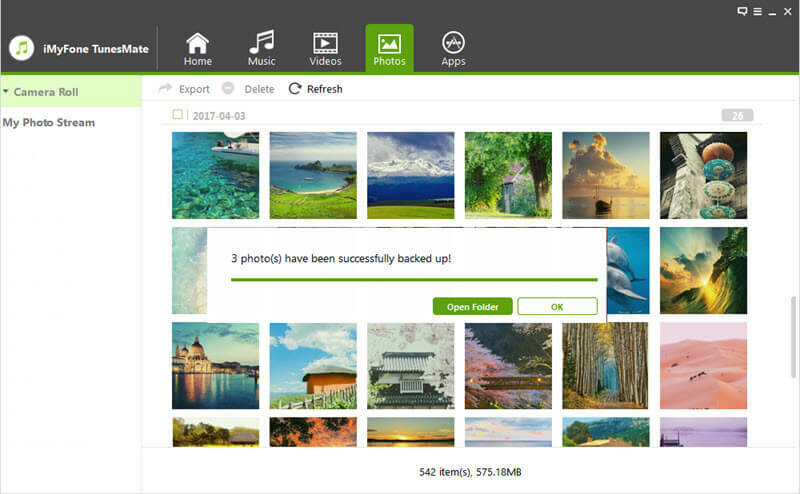 iMyFone TunesMate offers the quickest and easiest way to back up your photos from your iPhone, iPad or iPod touch to computer, including Camera Roll and My Photo Stream. 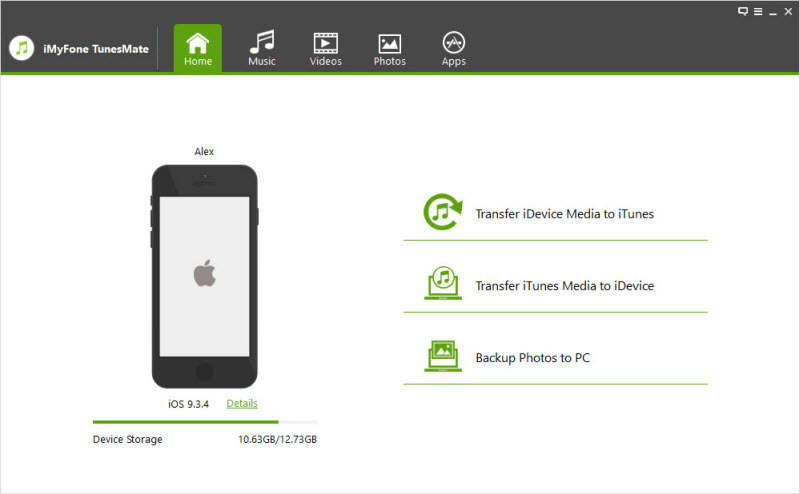 Please refer to the guide <1-Click Backup Photos to PC/Mac> for the detailed steps. Launch iMyFone TunesMate on your computer, and connect your iPhone/iPad/iPod with a USB cable. Click “Photos” icon from the top of the interface on TunesMate. You will be in the “Camera Roll” window by default. a. 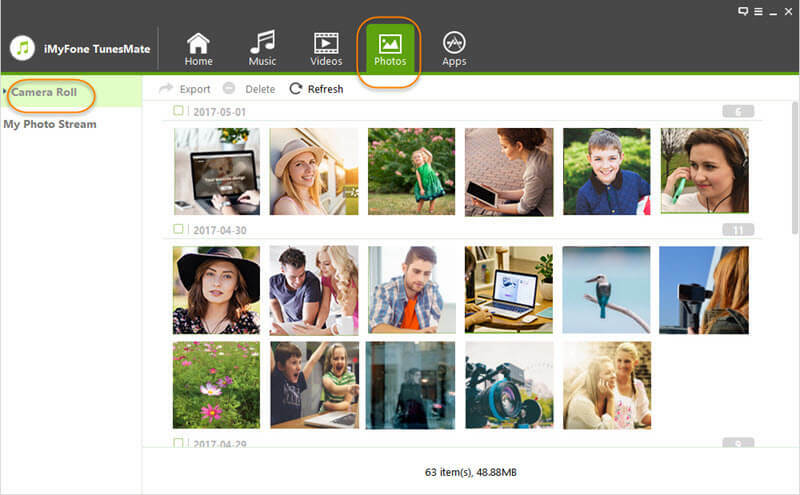 Select a specific photo category from the left sidebar: Camera Roll or My Photo Stream by clicking, and all the photos under this category will be displayed on the right panel according to added time. Note: You can also select an album under “Camera Roll/My Photo Stream” from the left sidebar, then all the pictures in this album will be displayed according to added time on the right panel. b. Check the photos you want to export to computer, and click “Export > Export to PC” at the top bar or right-click the selected photos and select “Export > Export to PC” from the drop-down list. 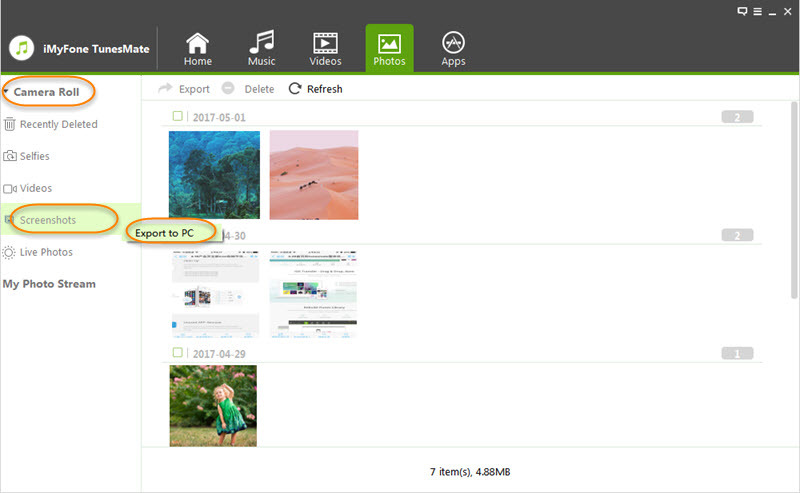 c. Browse and choose the target folder for the exported photos on computer from the pop-up window, tap “Select Folder” to begin the export process. a. Select a specific photo category: Camera Roll or My Photo Stream from the left sidebar, and right-click on it. Click “Export to PC” from the drop-down list. b. Browse and choose the target folder for the exported photos on computer from the pop-up window, tap “Select Folder” to begin the export process. a. Click a specific photo category: Camera Roll or My Photo Stream from the left sidebar, and all albums in it will be shown under it. Right-click on a specific album under the photo category, and click “Export to PC” from the drop-down list. b. Browse and choose the target folder for the exported album and photos on computer from the pop-up window, tap “Select Folder” to begin the export process. A window will pop up and show “Export Successfully”. 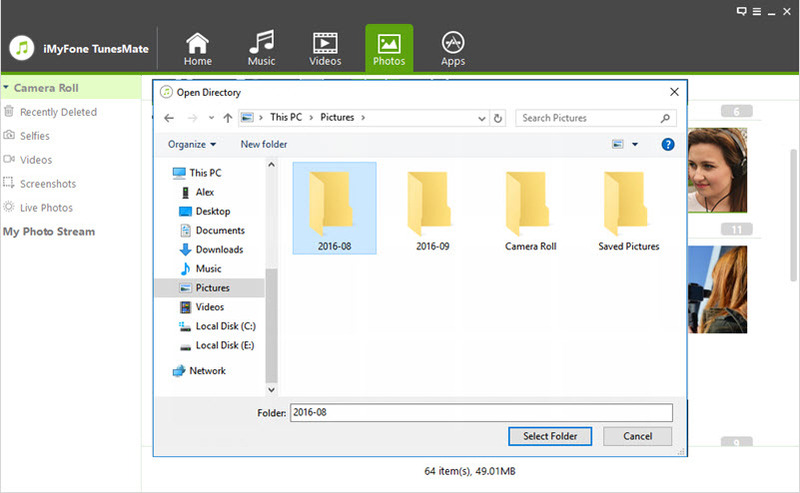 You can tap “Open Folder” to find the exported photos on computer or click “OK” to close the window. a. Click on the “Photos” icon at the top of the main interface, and you will be in the “Camera Roll” window by default. All the photos in Camera Roll will be displayed according to added time on the right panel. Note: You can also click the specific album under “Camera Roll” to enter its window, and all the photos in this album will be displayed according to added time on the right panel. b. 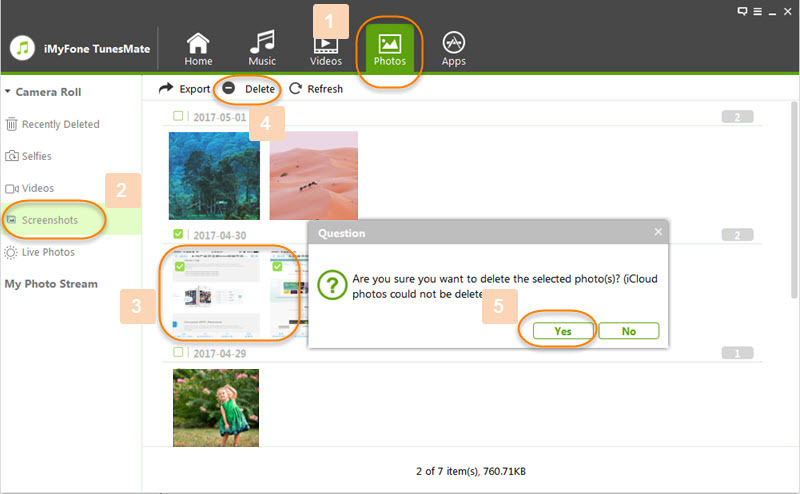 Check unwanted photos, and click “Delete” button from the top menu, or right-click on the checked photos and click “Delete” option from the drop-down list. Click “Yes” on the pop-up confirmation window. Note: iMyFone TunesMate doesn't allow to delete photos in My Photo Stream.